By Lynette T.G. Rudolfo, Manager of Public Services. A lei is a common symbol of love, friendship, celebration, honor, or greeting. In Hawai’i, it is a symbol of aloha. Leis can be made with various material from fresh flowers and leaves to paper and plastic. Great care is taken when making a lei because it is believed that the mana (or spirit) of the lei creator of the lei is sewn or woven into it. Therefore, when you give a lei, you are giving a part of you. Likewise, when you receive a lei, you are receiving a part of the creator of the lei. Birthdays, graduations, parties, weddings, dances, promotions, and celebrations all can be considered lei worthy. Since 1928, Hawai’i has celebrated every May 1st as it’s official “Lei Day” or “May Day.” The custom of weaving and wearing flower leis originated with the Hawaiians but there is no record of its beginnings. In 1927, the “poet Laureate of Hawai’i” and Oklahoma native, Don Blanding wanted to commemorate and celebrate the giving and receiving of a lei with a special day. Blanding states in the book, Hula Moons, that his idea was to let everyone wear a lei and give a lei on a day of general rejoicing over the fact that one lived in paradise. The editors of the Honolulu Star Bulletin, the paper on which he worked, agreed it was a good idea and presented it to the public and it took hold quickly. The flower lei is celebrated passionately on May 1st along with other festivities celebrating Hawaiian culture, hula, music, exhibits, and various contests. it is considered disrespectful to refuse a lei. Always graciously accept the lei with a smile and a kiss on the cheek or a hug. If you are allergic or sensitive to flowers, then discreetly and apologetically remove the lei. The proper way to wear a lei is on the shoulders draped half in the front and half in the back. It is acceptable to wear more than one lei at a time. Leis made with the ti plant are considered to bring good luck and to ward off evil spirits. Never give a closed lei to a pregnant woman, it is bad luck and signifies the umbilical cord around the baby’s neck. An open-ended lei is fine. Do not wear a lei that you intend to give someone else as it is considered bad luck. Today many people in Hawai’i and around the world enjoy giving and receiving leis. 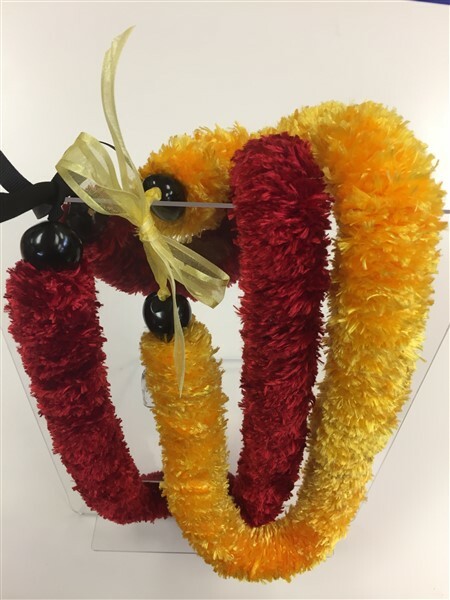 You can continue this custom by participating in the UH Law Library’s upcoming workshop on how to create a soft, lush, nani eyelash yarn lei on Tuesday, May 1st from 1:30pm -2:30pm in CJ’s Corner. Supplies will be provided but please RSVP. ← Beyond the Paywall: Using Link Resolvers to Find that Article!